Biorythyms measure 3 "Primary Cycles": Emotional, Intellectual and Physical. And 3 "Secondary Cycles": Wisdom, Mastery and Passion. Biorhythms are the natural cycles of life. They are natural biological cycles that course through every one of us. By measuring our biorhythm cycles we can track our highs and lows -- our ups and downs. The waves of our spiritual, emotional and physical well-being can be charted before our eyes. Biorhythms are energy wave-cycles which track the levels of our physical, emotional and intellectual energy levels. By entering your birth date into the biorhythm calculator above, you'll be able to calculate how well you're performing today using your biorhythm chart. The target date defaults to today's date, but you can also view your biorhythm chart for past and future dates as well. There are three primary biorhythm cycles. The primary cycles are the: "Emotional cycle", "Intellectual cycle" and "Physical cycle". Each of these three biorhythms oscillates at a different universal frequency starting on our date of birth. Our physical cycles oscillate on an approximate 23 day cycle. Our emotional cycles are slightly longer, oscillating on a 28 day schedule. Our longest cycles are our emotional cycles which oscillate on a 33 day cycle. This concept of oscillating cycles is also used in natal astrology. The 23 day "physical" cycle is also sometimes referred to as a "male cycle" while the 28 day cycle is often referred to as a "female" cycle -- but both men and women are influenced by all biorhythm cycles. By looking at your biorhythm chart, you'll be able to see how well you're performing on any given day, and what your potential (or lack of potential) may be. Your performance will be broken down into Emotional, Intellectual and Physical biorhythms. Each of our biorhythm cycles moves at different rates which begin the day we are born. These cycles oscillate up and down at regular intervals throughout our lives. Each cycle moves up and down between "+100%" positive and "-100%" negative. The theory behind biorhythms is that the cycles move according to "sinusoidal" patterns. These biorhythm waves measure human bio-electric energies which ebb and flow during the course of our lives. Because our biorhythm cycles move at different rates, we may have days where we are performing physically at optimum levels, but performing mentally at lower levels. On other days we may be functioning at peak intellectual levels but underperforming emotionally. Our biorhythms can be used to spot our "good days" and our "bad days". Sometimes those particularly lucky days will correspond with cycle peaks. And vice versa, those days when nothing seems to work out, correspond with cycle troughs. When a biorhythm cycle crosses the 0% line, there is neither an added value or a reduced value to that attribute, however these "critical" days are considered to be erratic. Performance on negative "critical days" (or 0% days) is unpredictable and may be characterized by random volatility. These are days when "anything can happen". Typically when we read biorhythm charts we look at the peaks and the lows of the biorhythm cycles, but these mid-range, or "0%" days can also tell an interesting story. Many biorhythm experts swear by the concept of biorhythm sports forecasting. 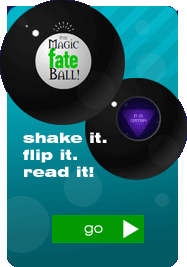 You can use the app on this page to enter the birth date of your favorite athlete and see if their upcoming game or match falls on a day when their physical cycle is high or low. About once a year, all three biorhythm cycles will cross on the same day. Pay very special attention to these days as they often mark major events, turning points and critical moments. You can use the biorhythm app above on this page to search ahead for your triple critical days and mark them on your calendar. In addition to the 3 primary "Physical, Mental and Emotional" biorhythm waves there are an additional set of "secondary biorhythm cycles". This second set of biorhythm cycles are "composite calculations" which can give greater insight into more complex physical and emotional states. The secondary biorythm cycles are: "Wisdom", "Mastery" and "Passion". You can also use biorhythms for couples to measure the romantic and physical compatibility between two people on any given day. 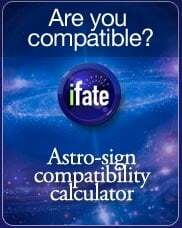 You can also use this to predict your romantic compatibility on any upcoming, future date. For more information about biorhythms and romance see our Biorhythms for Couples calculator. While the term "energy levels" is easy to understand, the actual principal is slightly more complex: Biorhythms represent sinusoidal oscillation of hormonal secretions and chemical levels which operate on different wavelengths throughout life. These rhythmic biological cycles begin at birth and (with very little variation) continue throughout life. Today it widely understood that biorhythm cycle-length corresponds -- lengthwise, at least -- to several scientifically proven biological rhythms. For example, the emotional cycle of 28 days, correlates well with length of hormonal cycles and the female menstrual cycle. While the emotional cycle and the menstrual cycle are usually not in synchronization it remains notable that the emotional cycle and hormonal cycles correspond so closely in terms of days. If we plot the sine waves forward on a calendar, we can see that both the 23 and 28 day cycles synchronize and renew every 644 calendar days. And more notably, all three biorhythm cycles synchronize and repeat every 21,252 days or roughly every 58.5 years. Using that math, a grandparent of 58 1/2 years could conceivably share an identical biorhthm with a grandchild. The secondary biorhythm cycles (which are also measured by the biorhythm calculator higher on the page) are derivatives of the first three primary cycles.) Secondary cycles are modeled by combining the results of the first three cycles into a plotted average of just two cycles each. These "linear combination" cycles give us a more nuanced insight into our daily energy levels. Passion biorhythm: The passion cycle is the result of a computed average of the emotional and physical biorhythm cycles. Wisdom biorhythm: The wisdom cycle is derived from the emotional and intellectual biorhythm data. Mastery biorhythm: The mastery cycle is calculated by averaging the physical and intellectual biorhythm waves. By analyzing the secondary cycles, it becomes easier to model more complex interactions of the human mind, as not all activities and mental states are the result of the three basic biorhythm cycles. By studying the interplay between secondary cycles it's possible to extract performance possibilities for a wide range of categories: Biorhythms for athletics, biorhythms for musical ability, and even biorhythms for luck. Biorhythm theory has many critics. From a non-scientific perspective alone, it's easy to point to hundreds of days where biorhythm measurements don't seem to "work". An athlete will win a gold medal on a day when her physical biorhythm is low. A meeting will go surprisingly poorly when mastery biorhythms are supposedly at their peak. The predictive capacity of energy cycle measurement is frequently miscast as a black-or-white, true or false measurement. Needless to say, life is more complicated than three primary waves and three secondary ones. It's also important to note that the length of the cycles varies somewhat from person to person. Anyone who's serious about the subject should perform their own biorhythm studies: Take note of your own personal variations and how they deviate from the cycles shown in biorhythm programs. It's very common to have slightly shorter rhythms or longer rhythms at different points in our lives. Biorhythms are not meant to be a hard and fast rule. Simply put: Biorhythms measure influences, not output. On a scientific basis, there is no arguing the importance of cyclical changes in human biology. Our daily sleep cycle is managed by complex circadian rhythms. The female menstrual cycle is measured on a roughly 28 day cycle. In other organisms, there are more complex rhythms at work. Trees are regulated by the annual cycle of the seasons. Likewise, many mammals hibernate for several months of every year. Thousands of species of aquatic life forms are influenced by the rhythm of the tides. Insects like cicadas are influenced by long 7 year and 14 year cycles. The idea of cycles governing human behavior is extremely old. 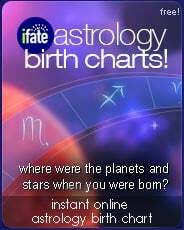 Any student of astrology knows that that cosmic cycles of both the natal astrology calendar and the lunar cycle have profound influence over human behavior. Likewise, health practitioners throughout the ages have well understood the importance of circadian rhythms, monthly changes in hormonal levels, and the seasonal influence on health, mental ability and emotional levels. While the study of cyclical influences over human behavior is very old, Biorhythms weren't calculated mathematically until the 19th century by physician Dr. Wilhelm Fliess. (Notably, Fliess was a patient of Sigmund Freud and communicated with Freud regularly about the study of psychology). In the early 20th century, the famed Austrian psychologist Hermann Swoboda also advanced a similar biorhythm theory of human energy cycles. Nearly two decades later, a professor by the name of Alfred Teltscher observed that his students seemed to perform better (and worse) on roughly 33 day cycles. Teltscher's observations were remarkably consistent with the earlier observations of both Fliess and Swoboda. The first published text on the science of biorhythms was the German text "Rhythm, Life and Creation" which was published in 1923 and written by Estonian researcher, Nikolai Parna. Parna's work formed the principal influence of the first contemporary era work on biorhythms, "Biorhythm - A Personal Science" by Bernard Gittelson which took the United States by storm in the 1970's. Gittelson's work was the first to be turned into computerized biorhythm calculators and biorhythm generators which appeared in the early 1980's from makers such as Casio. iFate's biorhythm calculator contains calculations for both the first three primary biorhythms, and the secondary biorhytm cycles. When viewing the biorhythm charts, you will find the value for the biorhythm for today at the left side of the chart. To the right of the first number you will see tomorrow's biorhythm and your biorhythm calendar for the next 2 weeks. 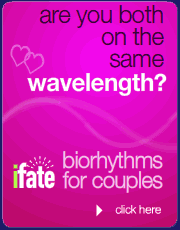 If you enjoy iFate's web-based biorhythm app, try iFate's Biorhythms for Couples. Biorhythm for Couples plots two superimposed sets of individual biorhythms in order to draw behavioral correlations between two different individuals. While biorhythm compatibility is used primarily for measuring the biorhythms of two people involved in romantic relationships, it can also be used to measure the relative biorhythm levels between any two people, whether romantically involved or not.